Father's Day is right around the corner, so we wanted to take a closer look at the Secrid wallets we carry. They are small, minimalistic wallets that hold much more than first meets the eye, and they make great gifts - for others or for yourself! The aluminum case carries 4-6 cards, and is RFID blocking, which means that you never need to worry about accidental or unwanted scans. You simply flick the tab at the bottom, and the cards pop up, staggered for ease of removal. Simple, efficient, and reliable. The wallets come in single and double sizes, as well as with or without a snap closure. We have recently brought in brighter and bolder colours on top of the classic browns, blacks, and blues - there's something for everyone! 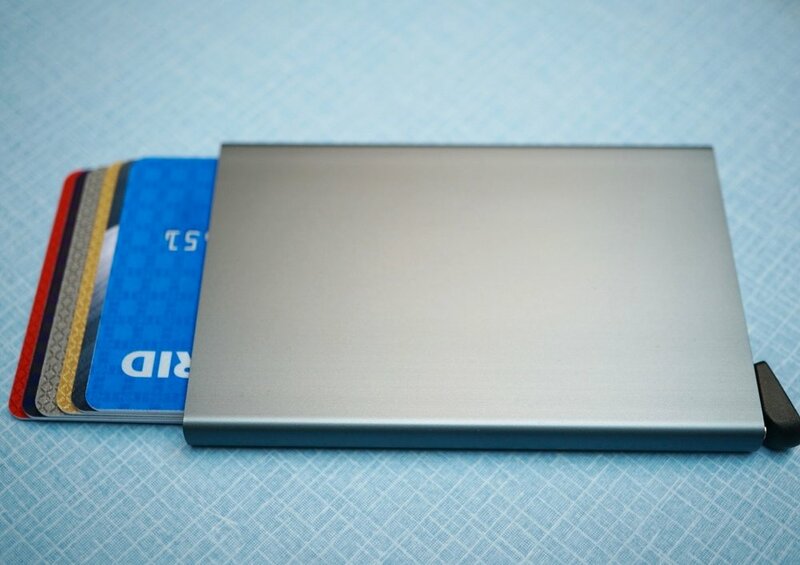 You can also buy the aluminum case on its own, or pair it with a backing that allows for a secret compartment where you can store sim cards, cash, or other cards. A thick elastic band secures the two parts together, while allowing for a smooth slide. These wallets are wonderfully compact. We know how easily bags get filled - and these wallets are great space savers, whether you're keeping it in your bag or your pocket. We are always on the lookout for creative and innovative items, and we think that these wallets fit the bill!